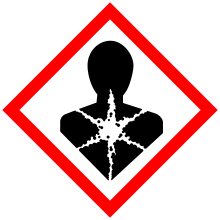 The internaitional pictogram for chemicals that are sensitisin, mutagenic, carcinogenic or toxic tae reproduction. A carcinogen is ony substance, radionuclide, or radiation that is an agent directly involved in causin cancer. This page wis last eeditit on 24 August 2015, at 20:15.